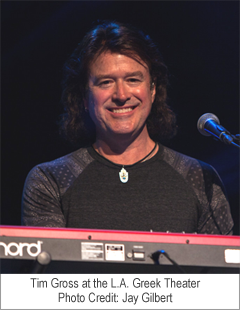 I’m currently touring the country playing keyboards in Rick Springfield’s band (he wrote “Jessie’s Girl” and has had 16 other top-40 hits as well.) I’ve also played with Cheap Trick’s singer Robin Zander and will be performing with the band Berlin’s singer Terri Nunn later this year. The photo of me to the left was taken performing at the L.A. Greek Theater last week. My point is that I’m a successful working musician, NOT a “piano teacher”, which means I approach playing piano in a very different (and more effective) way than traditional piano lessons. A few years ago my niece (a young teenager at the time) wanted to learn to play the piano, so she started taking traditional piano lessons, which she didn’t like very much and soon quit. She then told me she was trying to learn piano by watching YouTube videos. Out of curiosity, I searched YouTube for beginning piano video training, and was really surprised at how… horrible and confusing most of them were! Either they took forever to get to the point, or what they were saying wasn’t clear, or they were saying things that I didn’t consider to be very important. So I decided to create my own short video showing how I and musicians I work with approach music and how we think about and talk about notes and chords. It’s much different than the way traditional piano teachers teach their students. In that video I explained the basic framework of the mechanics of working out any Major/minor chord, any Major/minor chord, and how basic chords in a song are related. The “happy accident” part is that my first video has to date been viewed over 4 million times and is literally one of the most popular piano lessons online. Why? It stripped away all the pomp and circumstances surrounding learning the piano and quickly described the “number system” approach to understanding notes, chords, and scales. The important benefit of thinking of a “C – F – G” chord song as being a “1 – 4 – 5” song that’s in the key of C is this: If you know they’re 1 – 4 – 5 chords, you can change the key of the song easily just by knowing it’s still a 1 – 4 – 5 song that happens to be in a different key. Without understanding those numbers that represent what the chords are, you’d be clueless about playing the same simple song in a different key. That’s the benefit of the Number System. It lets you understand the framework that holds everything together. If you haven’t checked out the 10 free videos showing more, check them out. If you like like them, you should definitely try stepping up to a full piano training membership, because people who like it don’t just like it, they love it. I went through your 10 free lessons and understand your number system. I use it all the time for guitar playing. I took piano lessons when I was in elementary school. I learned the bare bone basics. My teacher never taught me patterns like your number system. I actually had 2 different teachers, because it was a complicated instrument for me to learn. 25 years later….. I am giving it another go and you have already made sense of what I know. I guess your system makes sense out of the scales and chords that I was grounded every weekend for not knowing! Haha! Here’s to turning 35 and finally playing songs on the piano that I can sing along to!! Let’s hope my singing lessons at least payoffed in the end. Thanks for your help.